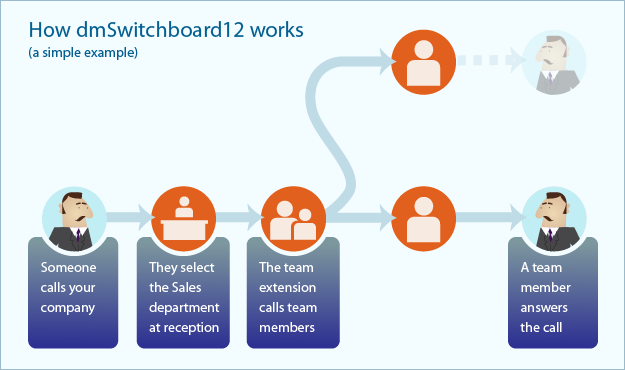 dmSwitchboard12 is a virtual switchboard designed to handle your company's phone calls: inbound, outbound and internal. With its web-based interface it's easy to set up and control. It can be used both inside and outside the office, and is the first switchboard that allows VOIP and traditional telephony to be combined seamlessly. Your switchboard's 'plan' controls how calls are handled, using a mixture of reception, team and personal extensions. Each extension can have a direct dial inwards (DDI) number allocated to it. Hunt Parallel ringing, to optimal control of answering times and call distribution. When you are busy with lots of calls it's important that you don't leave callers waiting too long. The team extension 'hunts' the available team members until one takes the call. CallerID is essential to starting a call properly, whether you are taking inbound calls or making outbound ones. Enhanced Call Information shows how the call came through the switchboard, so that you can answer with the appropriate company and department greeting. Set a company wide default, then override on a per-extension basis as required. dmSwitchboard12 will help your business to handle calls effectively, and ensure that as many calls as possible get answered. With over 20 unique features, and all the features you expect from an enterprise-grade switchboard, dmSwitchboard12 represents the future of switchboards. In particular, it’s the first system that gives you the freedom to combine VOIP and traditional telephony without restriction. The features fall into ten broad areas, outlined in the table to the right. Our pricing structure is transparent and easy to understand. The dmSwitchboard12 Starter Pack costs £24.95 for setup, then £9.50 per month. This includes a phone number. Or you can buy it for £19.95 setup and £7.50 per month on its own. If you want more inbound numbers or extensions these can be added at any time, and are charged per number and per extension. Finally, there is no long-term contract, so you can cancel your switchboard ay any time. All extensions can make outbound calls, and calls have easy-to-understand pricing. All costs are quoted in pence per minute. See calling costs on a country-by-country basis for the exceptions (mainly in the other 1/3rd of the world). Basic set up takes about 10 minutes. The starter pack comes with a free ProTime set up session, where one of our friendly experts helps you to get your switchboard up-and-running, assisting you in the creation of your first plan. The web-based plan editor allows you to create and edit plans at any time. Set up extensions for receptions, teams and people, and configure their behaviour. Associate them with direct numbers, set opening-hours, and adjust how long an extension rings before a call is sent to voicemail or your answering service. If you don’t understand something, or something goes wrong, our support team is here to help. Telephone and email support are available, in addition to web-based video tutorials, helpful notes, and trouble-shooting guides.